No medical therapy is available. In children with mesenteric or omental cysts, the most common indication for surgical intervention is the presence of an abdominal mass with or without signs of intestinal obstruction. Large mesenteric cyst arising from the small-bowel mesentery. Huge omental cyst within the greater omentum. Small omental cyst arising on a pedicle from the greater omentum in the region of the transverse colon. Multiple mesenteric cysts, some filled with chyle, arising from the jejunal mesentery. Huge mesenteric cyst arising from the transverse colon mesentery. Resection was required to remove this cyst. 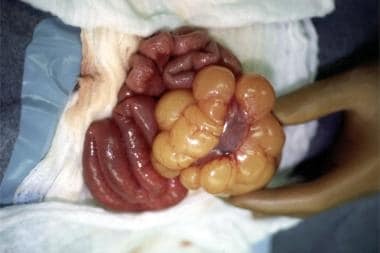 Multiple jejunal mesenteric cysts surrounding a loop of jejunum. Intestinal resection was required to remove these cysts. Mohanty SK, Bal RK, Maudar KK. 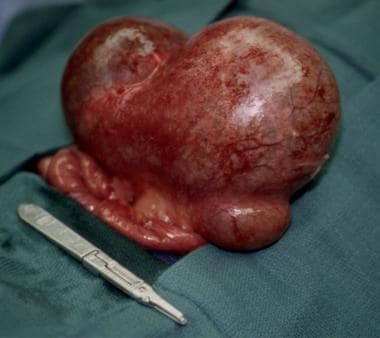 Mesenteric cyst--an unusual presentation. J Pediatr Surg. 1998 May. 33(5):792-3. [Medline]. von Rokitansky CF. Handbuch der pathologischen anatomie, bd2 Handbuch der Speciellen Pathologischen Anatomie. Vienna: Braumuller & Seidel; 1842. Gairdner WT. 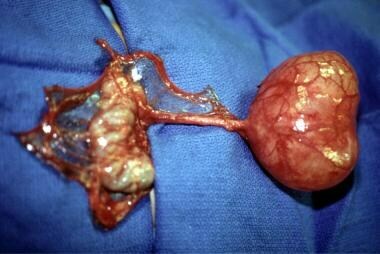 A remarkable cyst in the omentum. Trans Path Soc Lond. 1852. 3:1851. Tillaux PJ. Cyste du mesentere un homme: ablation par la gastromie: quersion. Revue de Therapeutiques Medico-Chirurgieale Paris. 1880. 47:479. Feins NR, Raffensperger JG. Cystic hygroma, lymphangioma, and lymphedema. Raffensperger JG, ed. Swenson’s Pediatric Surgery. 5th ed. Norwalk, CT: Appleton & Lange; 1990. 172-3. Ricketts RR. Mesenteric and omental cysts. Coran AG, Adzick NS, Krummel TM, Laberge J-M, Shamberger RC, Caldamone AA, eds. Pediatric Surgery. 7th ed. Philadelphia: Elsevier Saunders; 2012. Vol 2: 1165-70. Egozi EI, Ricketts RR. 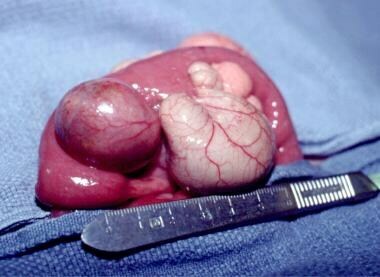 Mesenteric and omental cysts in children. Am Surg. 1997 Mar. 63(3):287-90. [Medline]. Vanek VW, Phillips AK. Retroperitoneal, mesenteric, and omental cysts. Arch Surg. 1984 Jul. 119(7):838-42. [Medline]. Mollitt DL, Ballantine TV, Grosfeld JL. Mesenteric cysts in infancy and childhood. Surg Gynecol Obstet. 1978 Aug. 147(2):182-4. [Medline]. Bliss DP Jr, Coffin CM, Bower RJ, Stockmann PT, Ternberg JL. Mesenteric cysts in children. Surgery. 1994 May. 115 (5):571-7. [Medline]. Beahrs OH, Judd ES, Dockerty MB. Chylous cysts of the abdomen. Surg Clin North Am. 1950 Aug. 30(4):1081-96. [Medline]. Gross RE. The Surgery of Infancy and Childhood. Philadelphia: WB Saunders; 1953. 377-83. Skandalakis JE, Gray SW, Ricketts RR. The lymphatic system. Skandalakis JE, Gray SW, eds. Embryology for Surgeons. 2nd ed. Baltimore: Lippincott Williams & Wilkins; 1994. 891-7. Takiff H, Calabria R, Yin L, Stabile BE. Mesenteric cysts and intra-abdominal cystic lymphangiomas. Arch Surg. 1985 Nov. 120(11):1266-9. [Medline]. Lee DL, Madhuvrata P, Reed MW, Balasubramanian SP. Chylous mesenteric cyst: A diagnostic dilemma. Asian J Surg. 2016 Jul. 39 (3):182-6. [Medline]. Kushwaha JK, Gupta R, Mohanti S, Kumar S. Primary mesenteric hydatid cyst. BMJ Case Rep. 2012 Jul 9. 2012:[Medline]. Aytekin S, Alyamac G. Two new cases with Costello syndrome. Dermatol Online J. 2013 Aug 15. 19(8):19267. [Medline]. Kurtz RJ, Heimann TM, Holt J, Beck AR. Mesenteric and retroperitoneal cysts. Ann Surg. 1986 Jan. 203(1):109-12. [Medline]. [Full Text]. Gupta RK, Sah S, Sah PL, Shah BP. Congenital omental cyst. BMJ Case Rep. 2012 Aug 2. 2012:[Medline]. Schols RM, Stassen LP, Keymeulen KB, Bouvy ND. 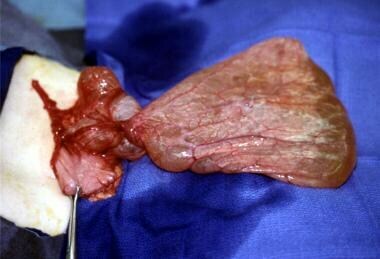 Dermoid cyst of the greater omentum: rare and innocent?. BMJ Case Rep. 2013 Feb 28. 2013:[Medline]. Sforza M, Andjelkov K, Ivanov D, Maricic Z, Krstic S. A rare case of benign omentum teratoma. Srp Arh Celok Lek. 2012 May-Jun. 140(5-6):362-4. [Medline]. Chirathivat S, Shermeta D. Recurrent retroperitoneal mesenteric cyst. A case report and review. Gastrointest Radiol. 1979 Apr 15. 4(2):191-3. [Medline]. Chung MA, Brandt ML, St-Vil D, Yazbeck S. Mesenteric cysts in children. J Pediatr Surg. 1991 Nov. 26(11):1306-8. [Medline]. Hebra A, Brown MF, McGeehin KM, Ross AJ 3rd. Mesenteric, omental, and retroperitoneal cysts in children: a clinical study of 22 cases. South Med J. 1993 Feb. 86(2):173-6. [Medline]. Kosir MA, Sonnino RE, Gauderer MW. Pediatric abdominal lymphangiomas: a plea for early recognition. J Pediatr Surg. 1991 Nov. 26(11):1309-13. [Medline]. Molander ML, Mortensson W, Uden R. Omental and mesenteric cysts in children. Acta Paediatr Scand. 1982 Mar. 71(2):227-9. [Medline]. Walker AR, Putnam TC. Omental, mesenteric, and retroperitoneal cysts: a clinical study of 33 new cases. Ann Surg. 1973 Jul. 178(1):13-9. [Medline]. Wong SW, Gardner V. Sudden death in children due to mesenteric defect and mesenteric cyst. Am J Forensic Med Pathol. 1992 Sep. 13(3):214-6. [Medline]. Lockhart C, Kennedy A, Ali S, McManus D, Johnston SD. Mesenteric cysts: a rare cause of abdominal pain. Ulster Med J. 2005 May. 74 (1):60-2. [Medline]. Yoon JW, Choi DY, Oh YK, Lee SH, Gang DB, Yu ST. A Case of Mesenteric Cyst in a 4-Year-Old Child with Acute Abdominal Pain. Pediatr Gastroenterol Hepatol Nutr. 2017 Dec. 20 (4):268-272. [Medline]. [Full Text]. Prasad KK, Jain M, Gupta RK. Omental cyst in children presenting as pseudoascites: report of two cases and review of the literature. Indian J Pathol Microbiol. 2001 Apr. 44(2):153-5. [Medline]. Karhan AN, Soyer T, Gunes A, Talim B, Karnak I, Oguz B, et al. Giant Omental Cyst (Lymphangioma) Mimicking Ascites and Tuberculosis. Iran J Radiol. 2016 Jul. 13 (3):e31943. [Medline]. [Full Text]. Maung M, Saing H. Intestinal volvulus: an experience in a developing country. J Pediatr Surg. 1995 May. 30(5):679-81. [Medline]. Monabati A, Safavi M, Solhjoo F. Extragastrointestinal Stromal Tumor Presenting as Omental Cyst. J Gastrointest Surg. 2016 Jun. 20 (6):1275-7. [Medline]. Kokhanovsky N, Nachtigal A, Reindorp N, Shinhar D, Zeina AR. Giant omental hemorrhagic cyst presenting as acute hemorrhagic anemia in a 21-month-old infant. Pediatr Emerg Care. 2014 Mar. 30 (3):188-90. [Medline]. Burnett WE, Rosemond GP, Bucher RM. Mesenteric cysts: Report of three cases, in one of which a calcified cyst was present. Arch Surg. 1950. 60:699-706. Chou YH, Tiu CM, Lui WY, Chang T. Mesenteric and omental cysts: an ultrasonographic and clinical study of 15 patients. Gastrointest Radiol. 1991 Fall. 16 (4):311-4. [Medline]. Wootton-Gorges SL, Thomas KB, Harned RK, Wu SR, Stein-Wexler R, Strain JD. 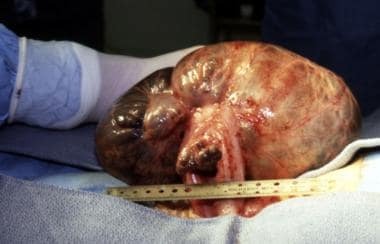 Giant cystic abdominal masses in children. Pediatr Radiol. 2005 Dec. 35 (12):1277-88. [Medline]. Nakano T, Kobayashi M, Usui T, Hanazaki K. Omental pseudocyst. Radiat Med. 2007 Aug 1. 25(7):364-7. [Medline]. Luo CC, Huang CS, Chao HC, Chu SM, Hsueh C. Intra-abdominal cystic lymphangiomas in infancy and childhood. Chang Gung Med J. 2004 Jul. 27 (7):509-14. [Medline]. Alqahtani A, Nguyen LT, Flageole H, Shaw K, Laberge JM. 25 years' experience with lymphangiomas in children. J Pediatr Surg. 1999 Jul. 34(7):1164-8. [Medline]. Catania VD, Briganti V, Di Giacomo V, Miele V, Signore F, de Waure C, et al. Fetal intra-abdominal cysts: accuracy and predictive value of prenatal ultrasound. J Matern Fetal Neonatal Med. 2016. 29 (10):1691-9. [Medline]. Polat C, Yilmaz S, Arikan Y, Mahallesi D, Caddesi KM. Mesenteric cysts. Surg Endosc. 2004 Jan. 18 (1):169. [Medline]. Trompetas V, Varsamidakis N. Laparoscopic management of mesenteric cysts. Surg Endosc. 2003 Dec. 17(12):2036. [Medline]. Bhandarwar AH, Tayade MB, Borisa AD, Kasat GV. Laparoscopic excision of mesenteric cyst of sigmoid mesocolon. J Minim Access Surg. 2013 Jan. 9(1):37-9. [Medline]. [Full Text]. Pampal A, Yagmurlu A. Successful laparoscopic removal of mesenteric and omental cysts in toddlers: 3 cases with a literature review. J Pediatr Surg. 2012 Aug. 47 (8):e5-8. [Medline]. Al-Harfoushi R, Stevenson L, Binnie N. Mesenteric cyst: drained and marsupialised laparoscopically avoiding enterectomy. BMJ Case Rep. 2012 Jul 3. 2012:[Medline]. Ma A, Ayre K, Wijeyekoon S. Giant mesenteric cyst: a rare cause of abdominal distension diagnosed with CT and managed with ultrasound-guided drainage. BMJ Case Rep. 2012 Sep 3. 2012:[Medline]. Chang TS, Ricketts R, Abramowsky CR, Cotter BD, Steelman CK, Husain A, et al. Mesenteric cystic masses: a series of 21 pediatric cases and review of the literature. Fetal Pediatr Pathol. 2011. 30 (1):40-4. [Medline]. Ultrasound image demonstrating a thin-walled mesenteric cyst with an internal septum.